Hillary Clinton’s image has declined since June and is now the worst Gallup has measured for her to date. Her favorable rating has fallen five percentage points since June to a new low of 36%, while her unfavorable rating has hit a new high of 61%. Bill Clinton’s image has also slipped over the past year, with his current 45% favorable rating down five points since Gallup last measured Americans’ opinions of him in November 2016. Given his 52% unfavorable rating, more U.S. adults now have a negative than a positive opinion of the former president. His current rating is his lowest since March 2001, when it hit 39% after his rocky exit from the White House that included a series of controversial pardons as well as the Clintons taking, but later returning, gifts intended for the White House. At that time, 59% of Americans had an unfavorable view of Bill Clinton, his highest in Gallup’s trend. He did have favorable ratings lower than 39%, but those were measured early in his 1992 presidential campaign when a substantial proportion of Americans were not familiar enough with Clinton to offer an opinion of him. In contrast to Clinton and Trump, Bernie Sanders has been the most popular politician in America in polls during 2017. Pictures with the tweet show both Hillary and Bill Clinton sitting with Putin. Clinton supporters have been trying to smear Stein since the election under the mistaken belief that if Stein wasn’t running they would have picked up her votes. In reality, few who voted for Stein would have voted for a corrupt war monger like Clinton. Even if, which I think is unlikely, it turns out that Stein was a Russian agent, and this was revealed during the campaign, I might have voted differently, but still would not have voted for Clinton. Responding to a Senate Select Committee on Intelligence request for documents pertaining to interference in the 2016 election, former Green Party Presidential candidate Jill Stein said she is cooperating by sharing all communications relevant to the committee’s mission. “We take seriously the issue of potential interference in our elections, as demonstrated by our continuing efforts to investigate the integrity of the 2016 election and examine our voting machines that are widely known to be vulnerable, but which still have not been examined for evidence of interference. To restore trust in our elections and democracy itself, we must safeguard our elections from all potential sources of interference, whether by foreign state actors or domestic political partisans, criminal networks, lone wolves, or private corporations – including those who control voting software. Our campaign has observed the highest standards of transparency and integrity in our interactions with foreign nationals as well as Americans. Our communications with Russian individuals regarding an invitation to speak on international relations at the RT 10th anniversary media conference will confirm what we stated publicly at that time and since: that we did not accept any payment or even reimbursement for the trip, and that we made the trip with the goal of reaching an international audience and Russian officials with a message of Middle East peace, diplomacy, and cooperation against the urgent threat of climate change, consistent with long-standing Green principles and policies. We strongly support legitimate inquiry into any illegal activity in our elections – including quid pro quo deals, money laundering, corruption and violation of campaign finance laws. At the same time, we caution against the politicization, sensationalism and collapse of journalistic standards that has plagued media coverage of the investigation. In the current climate of attacks on our civil liberties, with the emergence of censorship in social media and the press, criminalization of protest, militarization of police and massive expansion of the surveillance state, we must guard against the potential for these investigations to be used to intimidate and silence principled opposition to the political establishment. 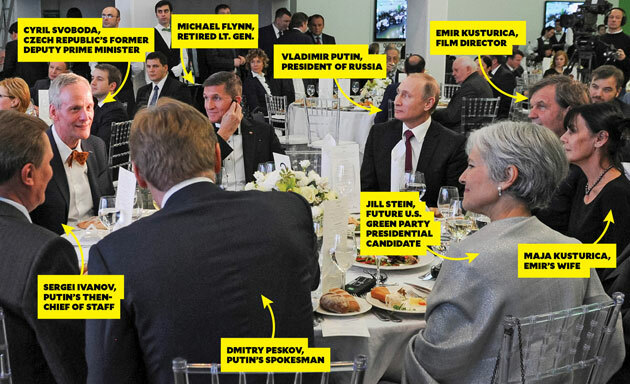 Stein also described the dinner, along with how minimal her contact was, in this interview with Jeremy Scahill.